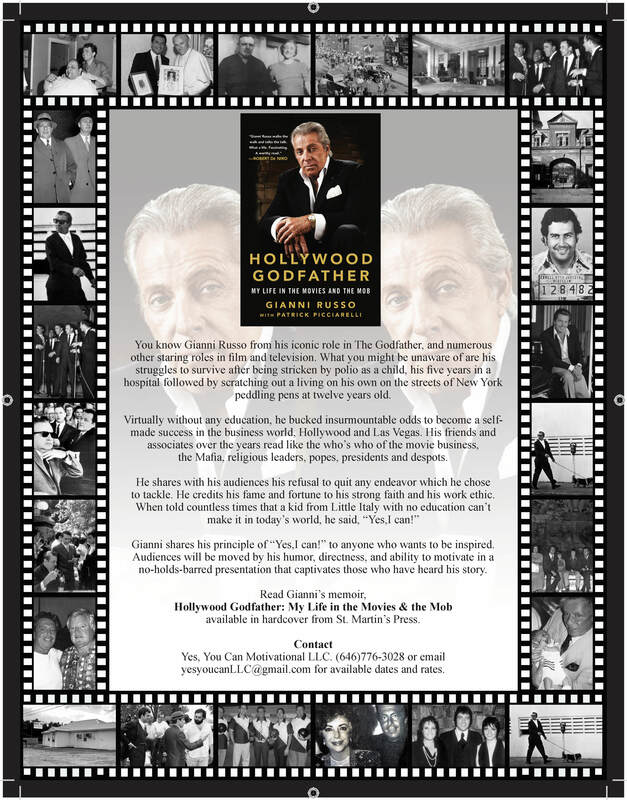 Gianni Russo is sharing his remarkable life via motivational public speaking events across the country. While Gianni’s show business career is well documented, his ability to succeed in business, his years of association with the Mafia, the Hollywood scene, and international dealings with godfathers, popes, and presidents are less known. From humble beginnings on New York’s Lower East Side, Gianni was on his own on the streets of the city peddling pens at the tender age of twelve after five years in a polio ward and living in the basement of a bakery shop. Gianni will share with his audiences his personal hardships and eventual phenomenal success in the business world despite little formal education by never giving up. His story will resonate with individuals who are looking for motivation from this unlikely source; a man who fought his way to the top, and by sharing his message of “Yes, you can!” with those who are striving to become a success. Copyright 2018 © Yes You Can Motivational, LLC.